We were not sure what to expect when we scheduled this month’s tasting of single-origin espressos from coffees grown in the New World (meaning coffees from the Americas rather than from Africa or the Pacific). Would we receive a run of light-roasted, brightly acidy, perhaps sharp espressos of the style that seems to have become fashionable over the past few years among some smaller, leading-edge roasting companies? And, perhaps confusing matters, would we also confront espressos leaning toward the other extreme, bittersweet and dark-roasted in an older style? We were sufficiently concerned about achieving a balanced response to a possibly polarizing group of coffees that we decided to invite not just one guest taster, as we usually do for our espresso articles, but two. To bring what we figured would be a sophisticated version of the more traditional espresso palate to our tasting, we invited John DiRuocco, Green Coffee Buyer and Quality Control Supervisor for Mr. Espresso, a distinguished Oakland, California roaster that since 1982 has specialized in producing impressive espressos of the classically round, smooth style often associated with northern Italy. (Incidentally, Mr. Espresso also produces excellent examples of other styles of coffee.) And to hypothetically represent a palate possibly more calibrated to newer, brighter styles of espresso, we invited Jen Apodaca, currently Director of Roasting for West Coast importer Royal Coffee’s new Lab & Tasting Room, whose extensive coffee credentials include key positions at a succession of celebrated coffee companies of the newer style, including Ecco Caffè, Intelligentsia Coffee & Tea and Blue Bottle Coffee. In this anticipated scenario, I would be the third taster. We imagined a lively three-person panel arguing the merits of smoother, rounder, more chocolaty espressos versus more tartly bright, citrusy-floral styles. First of all, the coffee samples we received were, by and large, neither the brightly acidy style now associated with many of the so-called third wave of light-roasters, nor variations on the older bittersweet, dark-roasted style popularized by Starbucks and its many imitators. Most settled into a gently bright, sweetly nuanced position in between. True, all were light- to medium-roasted, but apparently owing to skillful management of the roast profile and tactful green coffee selection, almost none were sharply acidy or tart. Nor, as it turned out, did the tasting panel itself polarize around preferences for contrasting styles of espresso. Although some differences did surface among the three of us, these differences were more focused on characteristics of specific green coffees than on general preferences in regard to espresso style or darkness of roast. We tested 21 espressos. The 10 highest-rated, ranging between 91 and 93, are reviewed here. Some general observations: All 10 reviewed samples were subtly but distinctively different, a good sign for espresso aficionados looking for pleasing variation. However, they did share some similarities. All ranged in roast level from medium- to light-roasted. All were inherently sweet. None showed prominent bitter tendencies, and only one could even be called brisk. Some were bright and citrusy, but gently and sweetly so. Mouthfeel tended to read as smooth and satiny rather than heavy or syrupy. Perhaps the most classic espresso profile was offered by the Las Chicas del Café Nicaragua Espresso del Patron (93), a coffee roasted toward the darkish edge of medium and composed of a blend of both dried-in-the-fruit or “natural-” processed and wet- or “washed-” processed beans from the same Nicaraguan farm. It showed distinct chocolate and caramel tendencies and a robust, balanced structure. Taster John DiRuocco called it a “chocolate bomb” in cappuccino-scaled milk. On the other hand, probably the brightest and most citrusy of the 10 reviewed espressos was the honey-processed PT’s El Salvador Lagunita Finca Los Planes (91), although it too displayed a rounding chocolate that softened and complicated the citrus and flowers. With neither coffee was there much difference in readings or ratings among the three reviewers. Other samples that attracted consensus support and closely clustered ratings from the three reviewers tended to be gracefully balanced and complete, pleasingly complex but without idiosyncrasies or extremes. Two were wet-processed coffees: the Joe Van Gogh Panama Dos Ruedas (93) was pure and graceful yet resonant; the Noble Coffee Roasting Guatemala Palo Blanco (92), softly tart and honey-toned. 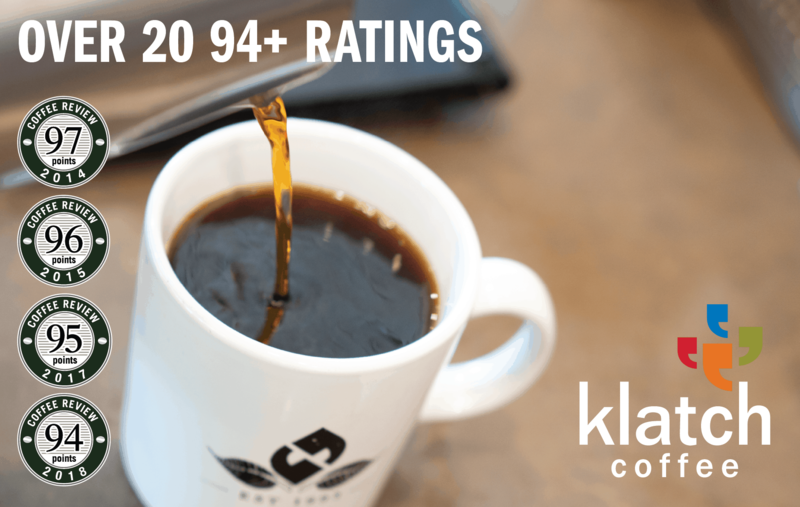 The 93-rated Magnolia Coffee Coast Rica Signature Reserve Don Pepe (93) was processed by the “black honey” method, which removes the fruit skin but allows the beans to dry enclosed in the fruit pulp. Not all honey-processed coffees are as sweet as the term suggests, but this one did display an almost candyish sweetness enveloping a tart but ripely orangy citrus. The four samples that polarized the panel tended to be dynamic but relatively idiosyncratic, with less balance than those that attracted consensus readings and ratings. The Yo El Rey Roasting Ecuador Cahasqui (93), for example, was fruit-toned and intense. For an enthusiastic Jen Apodaca (95) the fruit read as clean, balanced and complex, pleasingly tropical, whereas for me (93) it was more brandy- or grappa-toned and for John DiRuocco (90), spicy, perhaps a bit unsettling. 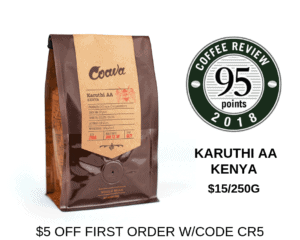 On the other hand, DiRuocco’s 95 was the top score for the Panama Santa Theresa Natural from Turning Point Coffee (92), a much crisper coffee than the Yo El Rey Ecuador, with briskly dry, tart-tending temperate fruit and lavender-like floral notes. I enjoyed the aromatics but held off at 91 because I was looking for a little more sweetness and a little fatter mouthfeel; Jen was lukewarm at 89. But read the fine print; you may agree with John. We conducted the tasting at the lab at Mr. Espresso in Oakland, California. Eric Lewis pulled the shots on a Faema Teorema A2 espresso machine using a Mazzer Kony Electronic grinder. As with all Coffee Review espresso tastings, we first sampled a straight shot, scoring it on aroma, mouthfeel or body, flavor and aftertaste, then evaluated a second shot mixed with three parts milk, heated but not frothed. Our deepest thanks to everyone at Mr. Espresso, reviewer John DiRuocco and barista Eric Lewis in particular, as well as to Jen Apodaca for spending significant portions of two days tasting with us. And, as always, thanks to those roasters who took a chance and sent us so many fine and expressive espressos. Jen Apodaca started roasting coffee in 2005 for McMenamins Inc. in Portland, Oregon. She subsequently worked as a Coffee Roaster and Quality Control Specialist for Ecco Caffè and for Intelligentsia Coffee & Tea, and was West Coast Production & Roasting Manager for Blue Bottle Coffee. She is now the Director of Roasting for The Crown: Royal Coffee Lab & Tasting Room. She has experience on several styles of roasting machines and is dedicated to the craft of making coffee more delicious. She is an International Juror for the Cup of Excellence, Chair Emeritus of the Good Food Awards for coffee committee, licensed Q- Grader, and serves on the Roasters Guild Executive Council as the Events Chair. John DiRuocco is second-generation coffee leader at Mr. Espresso, a family-owned roasting company celebrated on the West Coast for its long history of producing sweet, round espresso coffees slow-roasted using oak-fired roasting machines. Under John’s leadership Mr. Espresso has expanded its offerings, adding distinguished lighter-roasted single-origin coffees. John travels to coffee origins regularly and has served on many international green coffee juries.